I’m itching for a change. Part of it might be the winter blues. You see, I think I’m having bike ride withdrawal. I need patio beers, and grilled dinners. I’d like to walk to get ice cream, and wear maxi dresses, and be more freckled. But for now, I’ll brownie. Because there’s something therapeutic about chopping chocolate, and something even better about eating chocolate. And while these baked my kitchen was cozy warm and smelled dreamy. The moral of the story is this: at least there are brownies. Even if my day involves eating lunch standing in the kitchen with my winter coat on. It might be winter, but at least there is chocolate. Preheat your oven to 350F. Spray your baking dish with cooking spray. (8-inch square or 10 by 6 inch rectangle) and line with parchment paper. Spray with cooking spray again. In a medium bowl whisk together the malt powder, brown sugar, flour, cocoa powder, salt, and baking powder. Set aside. In a separate bowl, beat together the eggs, vanilla and oil. Mix the wet ingredients into the dry until no dry patches remain. Fold in 1/4 cup chopped whoppers and pour into the prepared pan. Sprinkle with 1/4 cup more chopped whoppers. Bake for about 30 minutes or until a skewer inserted in the center comes out clean. Remove from the oven and allow to cool completely on a wire rack. Alternately pop the brownies in the fridge to cool. Make Frosting by beating together the confectioners’ sugar, butter, cocoa powder, malt powder, vanilla and salt until mixed thoroughly. It will be crumbly and dry. Add the cold cream cheese all at once and beat on medium for 5 minutes until lightened in color and smooth. Don’t beat too long, or it can quickly become runny. 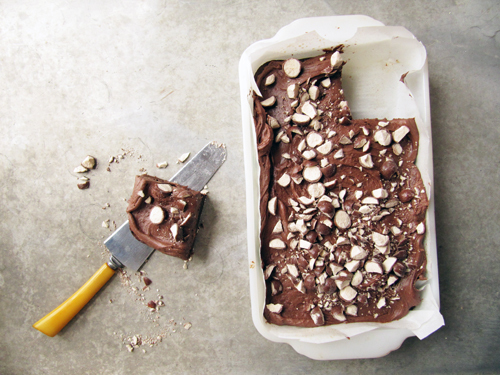 Once brownies are completely cool, frost with the cocoa cream cheese frosting and sprinkle with remaining 1/4 cup chopped whoppers. Slice and serve! This is me trying to eat just this little lady-like bite-size brownie. At least there are brownies. I like it. I’m pretty sure I’d eat the whole dang pan. How do you have such restraint? Gurrrrrl, I didn’t have restraint the whole time. I just needed 3 once, ya know? sometimes the only thing that helps is a brownie-dreamboat! 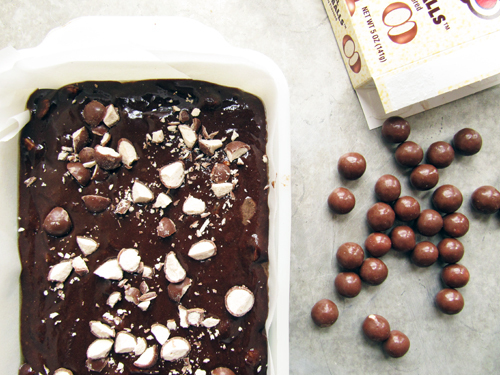 and at least there’s chocolate to accompany warm-weather daydreams! these look like DANGER!, of the best variety. You don’t even know my craving lately for patio beers and grilled dinners! I just need a whole pan of these in my face! Yes! These could be the dessert after picnic dinners! um serisouly?! this looks freakin awesome. malt anything is my weakness! I saw these the other day on A Cozy Kitchen and have been itching to make them since. And now that you have upped the ante with this friggin killer frosting, these have to happen in my kitchen this weekend. End of story. Malt is just too good! Gurrrrl, you just have to! So good. Chocolate makes everything better. And winter a little more bearable. Coca Cream Cheese Frosting is what sins are made of! YUM! So true. I want this frosting on all the brownies. 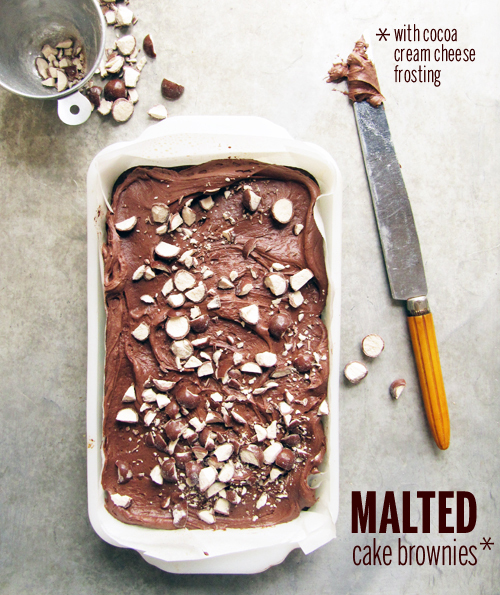 I love malted anything and these brownies are fabulous! I have a SERIOUS thing for all things malted, so much so that the candy clerks at my work have been known to hide the candy-coated Easter egg malt balls from me. Because I am a BEAST about them! This looks so divine, and just the thing to chase those winter blues away. Love the combination of cream cheese & malt balls! ha! Then these are meant to be your brownie boyfriend! 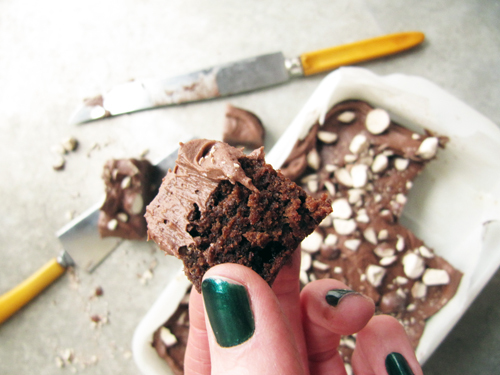 Malted Milk Chocolate Cake Brownies.